India is a colossal country, comprising of eclectic cultures, religions, people, and of course – fauna. Indeed, the primordial wildlife of India is spectacular, ranging from the common squirrel monkey to the magnificent Bengal tiger. But despite the extensive variety of natural beauty present in the nation, virtually no Indian is actually grateful for it; and everyone is wrapped up in his/her own insouciant yet prosaic life. This has become a major cause of the declination in the wildlife count. So Wildnest brings to you a blog post on the Big Five Wild Animals of India, and about what all a common man can do to tackle the threat posed to the species by human factors. Elephas Maximus Maximus, which is like elephas super-maximus, from Sri Lanka. 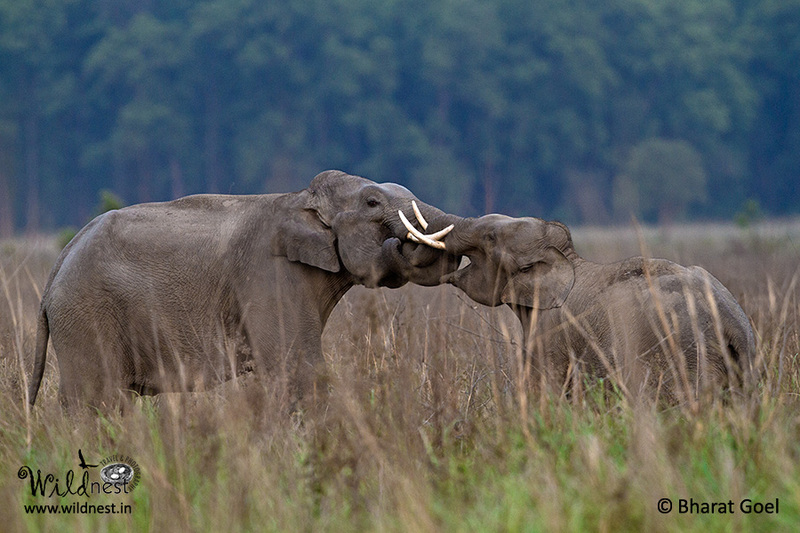 In 1986, the IUCN listed the Asiatic Elephant as ‘endangered’. Its population has gone down by approximately 50% in the past 70 years. So lest we want Just Kidding Rowling to run out of fancy spell names, it is imperative that we take action to prevent the demise of more of these elephants. The average height of these elephants is 7.3ft, which is a big thing (haha), considering that Shaquille o’ Neal is 7.1ft tall. The average weight is 2.72 tons, which is an even bigger thing because Shaquille o’ Neal weighs only 147kg. Also, contradictory to popular belief; the Asian Elephant is not fond of eating peanuts. Yep, the Tom & Jerry people lied. There are less than 35000 Asian Elephants left on earth. They can be found in evergreen forests, deciduous forests, dry thorn forests, and grasslands. The continually growing human population of tropical Asia has encroached on the elephant’s dense but dwindling forest habitat. About 20% of the world’s human population lives in or near the present range of the Asian elephant. Also, the poaching of these elephants for its tusks has led to a significant deterioration in its population. Best Places to see: Jim Corbett National Park, Kaziranga Natioanl Park, Rajaji National Park, Nagarhole National Park. The Royal Bengal Tiger is the most common tiger subspecies, found mainly in the Indian subcontinent. It was classified as an endangered species by IUCN in 2010. Only about 2500 of these tigers remain, with a constant decrease in that number continuing. And you thought that waking up on Monday morning is depressing. The beautiful creature has a slender 110 inch long body, a fuzzy light orange coat with periodic black stripes. It relies heavily on its jaws for survival; and has the incredible ability to kill animals twice its size (Shaquille o’ Neal better watch out). It has an extremely cogent roar that can carry for over 2km at night. And the Bengal Tiger also uses its coat as camouflage to give the prey a rather unpleasant surprise – and surprisingly, no two tigers have the exact same design of stripes. It can purr like a cute little kitten as well, though I’d suggest you don’t try that, no matter how graceful the tiger looks. 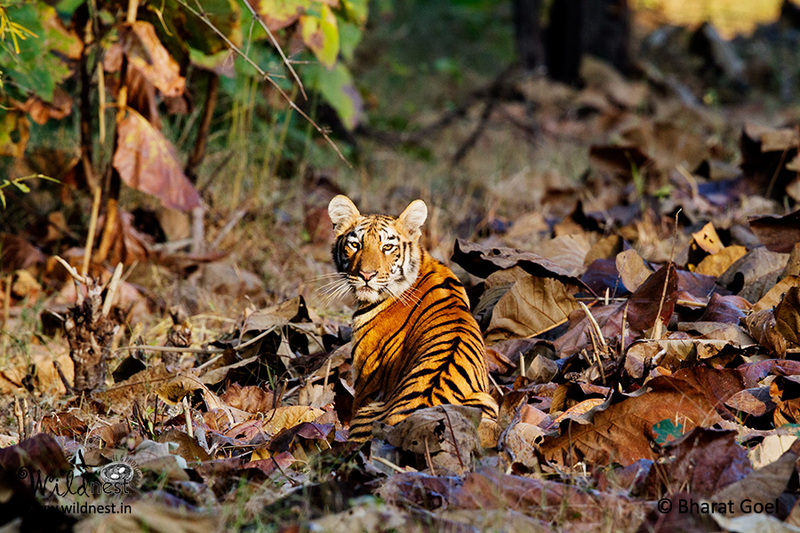 A lot of effort is being made to save the Bengal Tiger population. In India, many Tiger Conservation Units (TCUs) have been set up, namely Hazaribagh National Park, Ratapani Tiger Reserve, Kaziranga-Meghalaya Reserve and the Parambikulam Wildlife Sanctuary. But the number of tigers is still on the decline. Why? The basic reason would be apathy. No matter how much the government and the TCUs try, the tigers can only be saved if the common man is aware of the threat he poses to them. Also, none of the Tiger Conservation Landscapes within the Bengal tiger range is large enough to support an effective population size of 250 individuals. Deforestation and poaching have contributed significantly to the decline in the tiger population as well. Though the trade of poached skins has been declared illegal, the government has failed to implement adequate enforcement. It is a great ignominy for India that the Sariska Tiger Reserve lost all its tigers in 2006 due to poaching. The snow leopard is basically a sleek and magnificent large cat found in the mountainous regions of Central Asia. It is also the name of the famous IT company Apple’s operating system on Macintosh. But let’s not go there; partly because the animal is too beautiful to be ignored and partly because I can’t afford a Mac and it makes me dolorous. The genus of the snow leopard is panthera. They are generally smaller than the other species of the same category, and weigh around 27-55 kg. They also have a relatively small body, measuring about 30-50 inches. However, their tail is quite long, at 31-39 inches; and they live in areas 11000-22000 feet above sea level. Each snow leopard has unique, dark gray spots all over its body. It is regarded to be a solitary creature, living in rocky dens and occupying a large area for hunting. Though it may seem terrifying to smaller animals, the snow leopard is incapable of roaring. And it sure makes Shaquille o’ Neal look like a rookie because it has the ability to jump almost 50 feet far. The snow leopard is listed on the IUCN Red List of Threatened Species as globally Endangered, and its estimated count is 4510 – 7350. 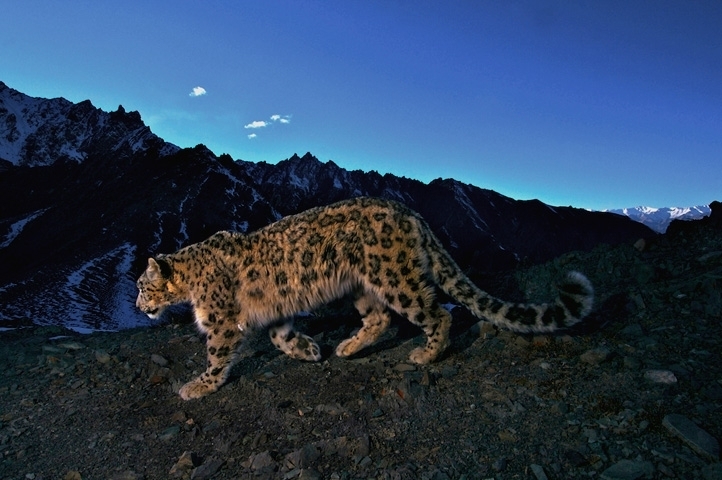 Numerous agencies are working to conserve the snow leopard and its threatened mountain ecosystems. These include the Snow Leopard Trust, the Snow Leopard Conservancy, the Snow Leopard Network, the Cat Specialist Group and the Panthera Corporation. The Indian Rhinoceros, also called the One Horned Rhinoceros, is the fifth largest land animal in the world. It is primarily found in Assam and in Terai, Nepal, along the grasslands in the foothills of the Himalayas. It is listed as a vulnerable species by the IUCN, with only about 3000 rhinos out in the wild. And you were thinking that your monthly salary is pretty feeble. The body length of an average Indian Rhinoceros is around 12.2 feet for males and 10.8 feet for females. The female weighs about 1600 kg and the male has a weight of approximately 2100 kg. The horn of the rhinoceros usually reaches a height of 9.8 inches. Contrary to what almost everyone believes, the horn is not bone but made of keratin – the substance that constitute our fingernails. That may explain why the Indian rhinoceros uses its jaws to defend itself, and not the horn. Despite its size, it is a lot faster than good old Shaquille o’ Neal, and can charge at a speed of 30 miles per hour. It is also a very gregarious creature, as it does not live alone but in groups. In the early 1900s, the One Horned Rhinoceros had almost become extinct due to extensive poaching and hunting. The population in Kaziranga had declined to a meager 12, even though hunting had become illegal at the beginning of the 20th century. Records state that from 1980 – 1993, 692 rhinos were poached in the entire nation. This led to the extinction of the species in the Laokhawa Wildlife Sanctuary. 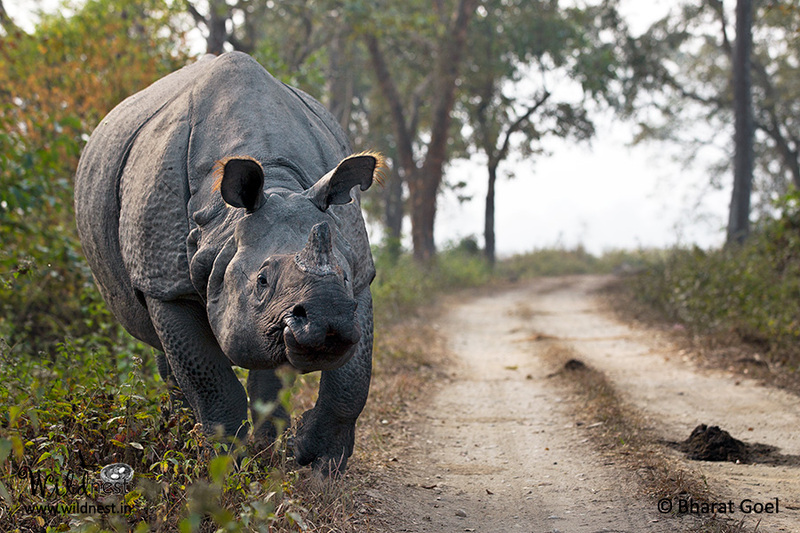 Major steps have been taken by the Indian and the Nepalese governments towards the protection of the Indian Rhinoceros. The Asiatic Lion is a subspecies that exists as a single isolated population in Gujarat. It is primarily found in Gir Forest National Park, where its population has increased significantly from 180 in 1974 to 411 in 2010. Due to such a low count, it has been listed as an endangered species. The male Asiatic lion weighs about 170 kg, and the female weighs about 110kg. Their tail is as long as 2 inches. The color of the fur ranges from light orange to buffish grey. The mane is less developed and the tail has a larger tuft as compared to the mane and the tail of the African lion. The Asiatic Lion is pretty much like me in terms of hard work – it rests for about 20 hours a day. It has a habit of hunting at night. Its age can be guessed by its mane, as the elder ones have a darker colored mane. And it is the second largest feline species in the world, only next to the tiger. The Asiatic Lion currently exists as a single subpopulation, and is thus vulnerable to extinction from unpredictable events, such as an epidemic or a large forest fire. Poaching incidents have been reported as well. The irrigation wells dug by the farmers in the Gir Forest area have also led to the drowning of these lions. The whole nation needs to wake up and realize that its nonchalance has led to the decline of its own natural pulchritude. Deforestation and poaching still take place in India to this day. The stigmatizing decline of the population of India’s Big Five should be looked upon with great concern, and everyone should take action to increase the count of the awe-inspiring creatures.